Many Tibet supporters know that Tibet was an independent country prior to the 1949-50 invasion by the People’s Republic of China. Less well-known is that Tibet was one of the great empires in Central Asia from the Seventh to Ninth Centuries, had diplomatic relations and signed treaties with several neighboring kingdoms and empires, and even briefly occupied the ancient Chinese capital of Xi’an. 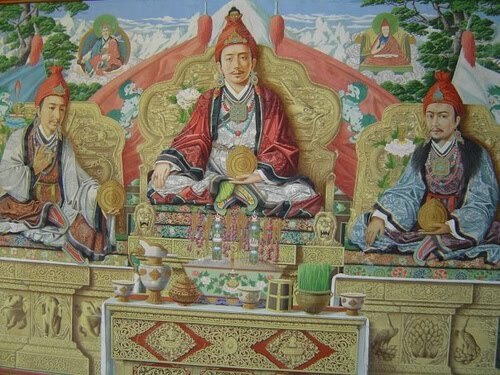 From this period Tibetans remember the three great Dharma Kings. The first of these Dharma Kings and perhaps the most famous was Songtsen Gampo (617-649/50), believed to be the thirty-third king of the Yarlung Dynasty, who founded the Tibetan Empire. Songtsen Gampo united various Tibetan tribes and established a matrimonial alliance with a Tibetan wife from the kingdom of Zhangzhung near Mt. Kailash. Both the Chinese and Nepalese princesses were Buddhist and it is said that the Chinese princess founded the Ramoche Temple in Lhasa (whose entrance faces east toward China) while the Nepalese princess founded the Jokhang (whose entrance faces west toward Nepal). Tibetan armies under Songtsen Gampo were known as strong and powerful warriors to the Chinese and the Tang Annals note their fine weapons, armor and bravery. The second great Dharma King was Trisong Detsen who ruled from 755 to c. 797 and is known for formally establishing Buddhism as the state religion in Tibet. Trisong Detsen invited both Indian and Chinese Buddhist scholars to a great debate in Samye, located between Lhasa and the historic Yarlung seat in Lhoka. Under Trisong Detsen’s reign, Indian scholars were invited to translate Buddhist canon into Tibetan, historic Samye Monastery was founded, and the Boudhanath Stupa in Kathmandu Valley was constructed. In 763, Tibetan armies under Trisong Detsen defeated Chinese armies and briefly occupied the ancient Tang Dynasty capital of Xi’an. With the Chinese emperor having fled, the Tibetans installed Li Chenghong as a puppet emperor for about a month. In 783 a treaty with China was concluded giving the entire Kokonor region to Tibet. In 778, Trisong Detsen formed an alliance with the King of Siam (modern Thailand) and they joined forces to fight Chinese armies in Sichuan. During the latter period of Trisong Detsen’s reign, he was preoccupied fighting the armies of the great Arab Caliph, Haroun Al-Rashid (of 1,001 Arabian Nights fame), as Tibetan armies expanded west. The last of the great Dharma Kings was Tri Ralpachen (reign c. 815-838). Under Ralpachen’s reign the Tibetan Empire reached its greatest extent and included parts of China, India, Nepal, and almost all of what is now called East Turkestan/Xinjiang. Ralpachen promoted Buddhism throughout Tibet and ordered translation of Buddhists texts into Tibetan. Ralpachen built a nine-story temple at U-shang-do, near the Tsangpo river, which contained Buddhist scriptures, chortens and images. China’s official White Paper on “Ownership of Tibet” describes very little of this period. The only references are to alliances between Tibetans and the Tang Dynasty and the marriage of Princess Wen Cheng to Songtsen Gampo. The White Paper mentions the Tang-Tibet treaty pillar in Lhasa but only references a section about the two empires being akin to uncle and nephew. There is no mention in the White Paper about the many military conflicts between Tibet and China during this period, the Tibetan occupation of Xi’an (under Trisong Detsen), or that the Tang Emperor had no choice but to give his daughter in order to placate the powerful Tibetan king Songsten Gampo. This may seem like ancient history but it is very relevant to Tibetans today. Last year Tibetans in exile (but not the Central Tibetan Administration (CTA)) celebrated the 100th anniversary of the 13th Dalai Lama’s declaration of independence from the Manchu Qing Dynasty in 1913. The 13th Dalai Lama issued the “The Proclamation of Independence,” a five-point public document reasserting Tibetan independence and ending the priest-patron relationship. The subsequent invasion and occupation of Tibet by the Chinese from 1949-1959 in no way diminishes the achievement of the 13th Dalai Lama in architecting Tibet’s emergence as a modern nation. February 13 is now being informally celebrated as Tibetan Independence Day by many Tibetans. This year, Tibetans and Tibet groups (though not the CTA) are commemorating the ancient Tibetan empire, including the treaty signed between Tibet and China in 821. We hope the Central Tibetan Administration will officially recognize the importance of February 13 with some form of formal acknowledgment. February 13 has become a day when Tibetans and supporters remember that Tibet is a great civilization with a proud and long history of independence.